Usually, a person would acquire the adult dog and then have the puppy but not us! Rose came to us first as a pup. When we were offered Rose’s mom, Greta, we jumped at the chance. Actually, I procrastinated and almost lost my chance! We have not regretted the decision to bring her on board for a second. This little gal is nothing short of amazing! What a joy to hunt behind one of these magnificent dogs! This little gal has what it takes! Happy dog after a good hunt. Goose hunting is hard work! 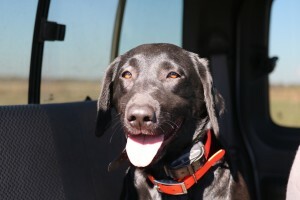 This is one hard working little pointing lab! 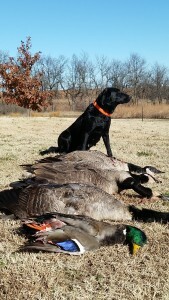 Greta’s first Kansas waterfowl hunt. 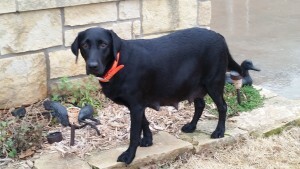 She wasn’t real happy when she went to retrieve a live goose almost as big as her but she did it! 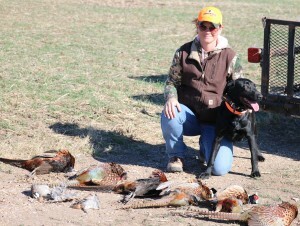 Her first upland hunt opening day in Kansas was very warm & dry. A difficult combination for any dog. It was our 1st experience with her too. She certainly didn’t disappoint us. 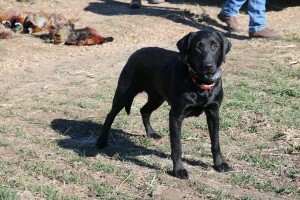 Blind or field, you’ve got it all with a POINTING LABRADOR! Our Greta a few days before her ‘Elite Eleven’ were born, New Year’s Day 2016! Nine beautiful pups, 3 males, 6 females. 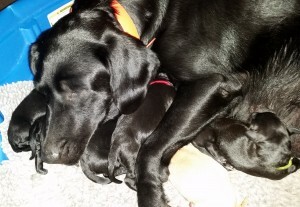 These pups boasted of 41 titles thru the AKC, UKC, & APLA in their 4 generation pedigree. They went to new homes the end of February, 2016.